1.7 Learning Minecraft: What Makes a Text Miner? What is text mining, and how can it be used? What relevance do these methods have to everyday work in information science and the digital humanities? How does one develop competences in text mining? 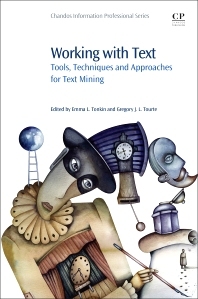 Working with Text provides a series of cross-disciplinary perspectives on text mining and its applications. As text mining raises legal and ethical issues, the legal background of text mining and the responsibilities of the engineer are discussed in this book. Chapters provide an introduction to the use of the popular GATE text mining package with data drawn from social media, the use of text mining to support semantic search, the development of an authority system to support content tagging, and recent techniques in automatic language evaluation. Focused studies describe text mining on historical texts, automated indexing using constrained vocabularies, and the use of natural language processing to explore the climate science literature. Interviews are included that offer a glimpse into the real-life experience of working within commercial and academic text mining. Gregory Tourte is Senior Research Associate at the University of Bristol in the School of Geographical Sciences where he started as a system administrator for the research group’s supercomputer and used this opportunity to research data management due to the large quantity of data being generated. He continues his work with deep time climate modelling within the Bristol Research Initiative for the Dynamic Global Environment (BRIDGE).